So you’ve got your new Makerfarm Prusa i3 3D printer all set up, printing, and maybe even tuned so it’s singing just beautifully. Now you hear there’s some new feature of the Marlin firmware that isn’t implemented on the version you’ve got installed. Can you just download the new version, flash it to your printer via the Arduino IDE and just roll right along? The thing is, Marlin, by default, is set up for the Ultimaker, which is a great printer, but is actually quite a bit different from the Prusa RepRap family, which includes the i3. Fear not, there is hope! 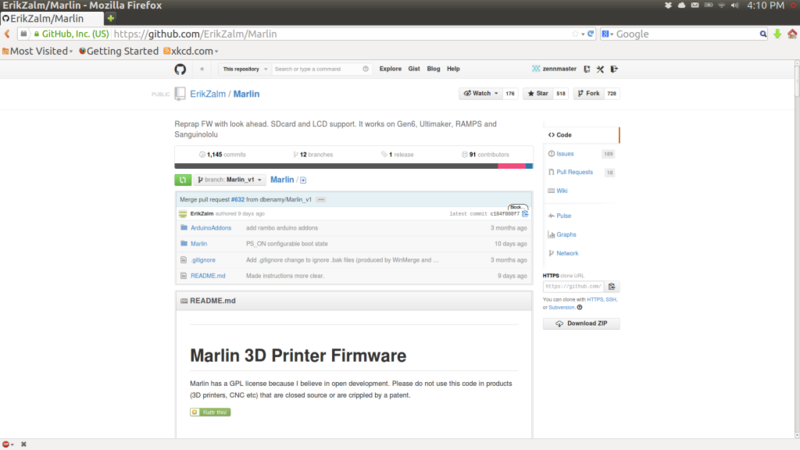 The front Page of ErikZalm’s Marlin repository on Github. In reality, Marlin is highly configurable, and with only a few quick and easy modifications, you can be running the latest and greatest version. The current version of Marlin. You can get that at ErikZalm’s GitHub respository.Click the “Download ZIP” button, and save and extract the file to a convenient location. You’ll be modifying and flashing these files, so put them somewhere where you’ll be able to work with them. The most recent firmware from the Makerfarm website (look under “Build Instructions”, and then look for “RAMPS Download”. Download the file, and extract the folder that matches your printer Mine is “Marlin_RAMPS-EPCOS_i3-8inch”. 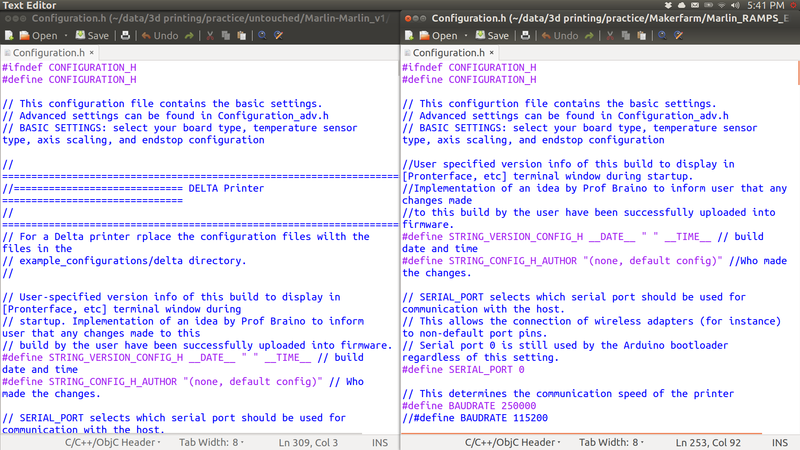 Now that you’ve got both versions, the “Standard” current Marlin, and the pre-configured Makerfarm version, you’re going to be looking for a file called “Configuration.h”. IMPORTANT NOTE: The Arduino IDE is going to insist that, within both of these projects, the file names need to be the same. Resist the temptation to rename one file something like “Configuration-old.h”, it won’t work. Keep both of these sets of files in different directories, and be EXTREMELY careful to keep them straight and separate. Once you’ve got both “Configuration.h” files opened, you’re basically going to be going through each one, and whenever a value is different between them, you’re going to replace the value in the “Vanilla” file with the one in the Makerfarm file. Two versions of the Marlin Configuration.h file – On the right, the Pre-configured Makerfarm version, and on the left, the unchanged default Marlin version. To get a new version of Marlin running properly on the Makerfarm Prusa i3, we’ll be replacing the default values with those in the Makerfarm-specific file. At this point, I highly recommend creating another text file to record all the changes you make. If something stops working, you’ve got a trail of breadcrumbs you can follow to fix whatever went wrong. In days past, the general practice was to record the line number, so you could easily see exactly where you made the changes. In the last couple of updates to Marlin, however, significant blocks of code have been added or removed, so the line numbers don’t match up well. I now recommend just recording the names of the variables you’ve altered, as well as the new and old values, so it no longer matters where they may have been moved within the file. Also, I have found it to be a good use of time to just explore the innards of the Configuration.h, just to get a feel for what is there. Under the heading Mechanical Settings There are few values to change. There will be six #defines immediately under this statement (Make sure you’re looking at the #ifdef, and not the #ifndef right above it). const bool X_MIN_ENDSTOP_INVERTING = false; // set to true to invert the logic of the endstop. const bool Y_MIN_ENDSTOP_INVERTING = false; // set to true to invert the logic of the endstop. const bool Z_MIN_ENDSTOP_INVERTING = false; // set to true to invert the logic of the endstop. const bool X_MAX_ENDSTOP_INVERTING = false; // set to true to invert the logic of the endstop. const bool Y_MAX_ENDSTOP_INVERTING = false; // set to true to invert the logic of the endstop. const bool Z_MAX_ENDSTOP_INVERTING = false; // set to true to invert the logic of the endstop. #define min_software_endstops false // If true, axis won't move to coordinates less than HOME_POS. This should get you running nicely with all the new features of Marlin! I do not guarantee that there are no mistakes here, or that this is a complete guide. I will keep this post updated as new features become available, and please feel free to contact me if you see that I’ve missed something important. https://github.com/ErikZalm/Marlin/issues/816 …at the bottom of the post the guy points out the line that needs to be edited. will give it a try. I got the ErikZalm \/Marlin version and he changed it 6 days it does not match your video, and I do not now if I should attempt to try it, wil you be making a new video? please do I want to know the parameter to change on my cnc marlin to drive , I have a 2560 mega 3 AXIS XYZ Arduino board guided by ( ballscrew 1605) 16mm in diameter, about DEFAULT_AXIS_STEPS_PER_UNIT okay I already is calculated is good . I wonder what other change ? .